Forget everything you think you know about DSLR photography. With its compact body, friendly guided interface, and many of the same conveniences as smartphones and tablets, the Canon EOS 200D is the perfect solution for compact users who thought a DSLR wasn’t right for them. Thanks to its latest-generation 24MP APS-C sensor, the Canon EOS 200D delivers stunning, detail-packed images in a range of conditions, the kind that would be hard to capture with a more basics smartphone. Furthermore, that large sensor allows you to record Full HD videos that look just as clear and detailed on your television as they do on your computer. You can experiment with video frame rates, flipping between natural and cinematic looks to suit your scenes, and even use it to capture time-lapse footage over extended periods. The Canon EOS 200D has also been designed to work in perfect harmony with your smartphone or tablet, rather than serve as a replacement. With Wi-Fi and NFC on board, you can effortlessly share your images with your friends and the wider world, without the hassle of cables, while always-on Low Energy Bluetooth functionality means you can keep your camera connected to your phone at all times to keep your images moving seamlessly from camera to smartphone. It’s just as easy to use as a smartphone too. You can tap the LCD where you want the camera to focus, for example, with the benefit of the world’s fastest Live View autofocus on board, and even swipe through images you’ve already taken. In fact, with the display’s Vari-angle design allowing you to flip it out to a range positions, you could argue it’s even more convenient – even if you’re just taking a selfie. Furthermore, with the benefit of an optical viewfinder on board, you can frame up your images with precision and comfort, while the 5fps burst shooting option lets you freeze fast-moving subjects at that critical moment. And if you think it’s too much of a burden to carry around, think again; it’s actually the world’s lightest DSLR with a Vari-angle screen, and will slip right into your everyday bag. Canon has also revamped the user interface to be with you every step of the way as you gain skills. The guided interface is your perfect partner for when you’re just getting started, with its colourful graphic display showing you what’s happening as you change different settings. Once you get more confident, you can switch to the more standard interface and take maximum control, whether you’re capturing long bursts of images or setting up the perfect landscape shot. You can also leave as much or as little to the camera when it comes to the all-important exposure settings, fully adjusting shutter speed and aperture as your creative urges take hold. And, of course, with an extensive support system of compatible Canon lenses and accessories, no image is out of reach of the inspired photographer. 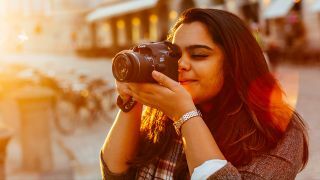 Whether you want to push your creativity far or simply take great images and videos without hassle, the Canon EOS 200D is your perfect companion. Click here for information on the Canon EOS 200D single-lens kit and here for information on the Canon EOS 200D double-lens kit.